Today in London radical history, 1870: a Land & labour League unemployed demonstration. 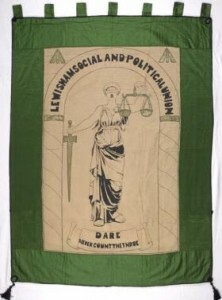 The Land and Labour League had been formed in October 1869, by a group of radical trade unionists affiliated to the International Working Men’s Association. The meetings had been proposed by the O’Brienite National Reform League and were attended by a variety of working class radicals, as evidenced by the somewhat eclectic programme. Its formation had been sparked by a discussion of the land question at the Basle Congress of the International Workingmen’s Association (the ‘First International’) earlier in the year. The League advocated the full nationalisation of land, in the interests of the people that worked it; its membership was associated with many of the working class activists and trade unionists who formed the backbone of the political reform movements of the 1860s-70s, (it has been described as the successor to the Reform League) the secularists and the shortlived working class republican network in London. Although originally concerned mainly with land nationalisation the League became the leading left republican organisation in Britain. Patrick Hennessey, an Irish trade unionist, was the Land League’s President. The secretaries were Martin J. Boon (who had been strongly influenced by the group that grew up around the former Chartist socialist James Bronterre O’Brien, based at the Eclectic Hall in Soho) and John Weston, and the treasurer was Johann Eccarius, well known figure in the English section of the First International. Boon’s involvement in the formation of the League is illustrated in the presence in the original principles of the L&LL many of the demands of the ‘O’Brienite’ wing of Chartism – nationalisation of the land; home colonization; equal electoral rights and payment of MPs, along with more more generally radical aims – free compulsory state education; abolition of standing army; state limitation of working hours. To this was added a plethora of concessions to the rising tide of currency reformism (single tax; nationalisation of the banks; abolition of national debt). Members of the IMWA’s General Council were noticeably active in the League. These included JG Eccarius, then a disciple of Marx, George Odger, John Weston, Martin J Boon and Tom Mottershead. Marx was a member of the League, joining on 30 November 1869, but did not play a prominent part. Charles Bradlaugh, the secularist, was also a leading figure. ‘The Republican’ (1 September 1870 to 1 February 1872) was the de facto publication of the League. Daniel Chatterton, former Chartist, secularist speaker, fiery communist orator, later of ‘Chatterton’s Commune’ fame, was the proprietor. The Land & League reached its organisational height due to wide spread public sympathy with the new French republic declared in 1870 at the end of the Franco-Prussian War. At a League rally on the issue of the war and the French Republic in January 1871, “a dense sea of human faces…men- workers primarily and a few women ‘daughters of Labour’ – understanding the speeches and keen about them; and on the platform a small knot of men, the Irreconcilables of English policy”. The latter included Beesly, his friend Harrison, Bradlaugh, Odger and Applegarth. (Eastern Post, 14 January 1871). Originally neutral, the League later helped organise an Anglo-French Intervention Committee to press for military action against the Prussians – at this meeting a motion for war if Alsace Lorraine was annexed was passed. This latter action and the outbreak of the Paris Commune brought dissensions. More moderate (Odger, Bradlaugh) and more radical (Weston, Boon) elements broke off. Competition from the middle class Land Tenure Association stole many of the surviving adherents. A rump of currency cranks lingered on until the end of the 1870s. Despite effectively petering out by 1873 the League had some radicalising impact on the Land Tenure Reform Association established by John Stuart Mill, which adopted a policy of taxing the unearned increment on land value under pressure from the League. Published: as a pamphlet Address of the Land and Labour League to the Working Men and Women of Great Britain and Ireland, London, 1869. This address is in fact the programme of the Land and Labour League; drawn up by Eccarius who was on the commission preparing it, and edited by Marx, and this found expression in the League’s programme. The fond hopes held out to the toiling and suffering millions of this country thirty years ago have not been realised. They were told that the removal of fiscal restrictions would make the lot of the labouring poor easy; if it could not render them happy and contented it would at least banish starvation for ever from their midst. They rose a terrible commotion for the big loaf, the landlords became rampant, the money lords confounded, the factory lords rejoiced — their will was done — Protection received the coup de grâce. A period of the most marvellous prosperity followed. At first the Tories threatened to reverse the policy, but on mounting the ministerial benches, in 1852, instead of carrying out their threat, they joined the chorus in praise of unlimited competition. Prepared for a pecuniary loss they discovered to their utter astonishment that the rent-roll was swelling at the rate of more than £2,000,000 a year. Never in the history of the human race was there so much wealth — means to satisfy the wants of man — produced by so few hands, and in so short a time as since the abolition of the Corn Laws. During the lapse of twenty years the declared value of the animal exports of British and Irish produce and manufactures — the fruits of your own labour — rose from £60,000,000 to £188,900,000. In twenty years the taxable income of the lords and ladies of the British soil increased, upon their own confession, from £98,000,000 to £140,000,000 a year; that of the chiefs of trades and professions from £60,000,000 to 10,000,000 a year. Could human efforts accomplish more? Alas! there are stepchildren in Britania’s family. No Chancellor of the Exchequer has yet divulged the secret how the £140,000,000 are distributed amongst the territorial magnates, but we know all about the trades-folk. The special favourites increased from sixteen, in 1846, to one hundred and thirty-three, in 1866. Their average annual income rose from £74,300 to £100,600 each. They appropriated one-fourth of the twenty years’ increase. The next of kin increased from three hundred and nineteen to nine hundred and fifty-nine Individuals: their average annual income rose from £17,700 to £19,300 each: they appropriated another fourth. The remaining half was distributed amongst three hundred and forty-six thousand and forty-eight respectables, whose annual income ranged between £100 and £10,000 sterling. The toiling millions, the producers of that wealth — Britania’s cinderellas — got cuffs and kicks instead of halfpence. In the year 1864 the taxable income under schedule D increased by £9,200,000. Of that increase the metropolis, with less than an eighth of the population, absorbed £4,266,000, nearly a half, £3,123,000 of that, more than a third of the increase of Great Britain, was absorbed by the City of London, by the favourites of the one hundred and seventy-ninth part of the British population: Mile End and the Tower, with a working population four times as numerous, got £175,000. The citizens of London are smothered with gold; the householders of the Tower Hamlets are overwhelmed by poor-rates. The citizens, of course, object to centralisation of poor-rates purely on the principle of local self-government. During the ten years ending 1861 the operatives employed in the cotton trade increased 12 per cent; their produce 103 per cent. The iron miners increased 6 per cent; the produce of the mines 37 per-cent. Twenty thousand iron miners worked for ten mine owners. During the same ten years the agricultural labourers of England and Wales diminished by eighty-eight thousand one hundred and forty-seven, and yet, during that period, several hundred thousand acres of common land were enclosed and transformed into private property to enlarge the estates of the nobility and the same process is still going on. In twelve years the rental liable to be rated to the poor in England and Wales rose from £86,700,000 to £118,300,000: the number of adult able-bodied paupers increased from one hundred and forty-four thousand five hundred to one hundred and eighty-five thousand six hundred. These are no fancy pictures, originating in the wild speculations of hot brained incorrigibles; they are the confessions of landlords and money lords, Recorded in their own blue books. One of their experts told the House of Lords the other day that the propertied classes, after faring sumptuously laid by £150,000,000 a year out of the produce of your labour. A few weeks later the president of the Royal College of Surgeons related to a jury assembled to inquire into the causes of eight untimely deaths, what lie saw in the foul ward of St. Pancras. Hibernia’s favourites too have multiplied, and their income has risen, while a sixth of her toiling sons and daughters perished by famine, and its consequent diseases, and a third of the remainder were evicted, ejected and expatriated by tormenting felonious usurpers. This period of unparalleled Industrial prosperity has landed thousands of our fellow-toilers — honest, unsophisticated, hardworking men and women — in the stone yard and the oakum room; the roast beef of their dreams has turned into skilly. Hundreds of thousands, men, women and children, are wandering about — homeless, degraded outcasts — in the land that gave them birth, crowding the cities and towns, and swarming the highroads in the, country in search of work to obtain food and shelter, without being able to find any. Other thousands, more spirited than honest, are walking the treadmill to expiate little thefts, preferring prison discipline to workhouse fare, while the wholesale swindlers are at large, and felonious landlords preside at quarter sessions to administer the laws. Thousands of the young and strong cross the seas, flying from their native firesides, like from an exterminating plague; the old and feeble perish on the roadside of hunger and cold. The hospitals and infirmaries are overcrowded with fever and famine-stricken: death from starvation has become an ordinary every-day occurrence. All parties are agreed that the sufferings of the labouring poor were never more intense, and misery so widespread, nor the means of satisfying the wants of man ever so abundant as at present. This proves above all that the moral foundation of all civil government, “that the welfare of the entire community is the highest law, and ought to be the aim and end of all civil legislation”, has been utterly disregarded. Those who preside over the destinies of the nation have either wantonly neglected their primary duty while attending to the special interests of the rich to make them richer, or their social position, their education, their class prejudices have incapacitated them from doing their duty to the community at large or applying the proper remedies; in either case they have betrayed their trust. Class government is only possible on the condition that those who are held in subjection are secured against positive want. The ruling classes have failed to secure the industrious wages-labourer in the prime of his life against hunger and death from starvation. Their remedies have signally failed, their promises have not been fulfilled. They promised retrenchment, they have enormously increased the public expenditure instead. They promised to lift the burden of taxation from your shoulders, the rich pay but a fractional part of the increased expenses; the rest is levied upon your necessaries — even your pawn tickets are taxed — to keep up a standing army drawn from your own ranks, to shoot you down if you show signs of disaffection. They promised to minimise pauperism: they have made indigence and destitution your average condition — the big loaf has dwindled into no loaf. Every remedy they have applied has but aggravated the evil, and they have no other to suggest, — their rule is doomed. To continue is to involve all in a common ruin. There is but one, — and only one, — remedy. Help Yourselves! Determine that you will not endure this abominable state of things any longer; act up to your determination, and it will vanish. A few weeks ago a score of London working men talked the matter over. They came to the conclusion that the present economical basis of society was the foundation of all the existing evils, — that nothing short of a transformation of the existing social and political arrangements could avail, and that such a transformation could only be effected by the tolling millions themselves. They embodied their conclusions in a series of resolutions, and called a conference of representative working men, to whom they were submitted for consideration. In three consecutive meetings those resolutions were discussed and unanimously adopted. To carry them out a new working men’s organisation, under the title of the “Land and Labour League”, was established. An executive council of upwards of forty well-known representative working men was appointed to draw up a platform of principles arising out of the preliminary resolutions adopted by the conference, to serve as the programme of agitation by means of which a radical change call be effected. National, Secular, Gratuitous and Compulsory Education. A Direct and Progressive Property Tax, in Lieu of All Other Taxes. Liquidation of the National Debt. Liquidation of the Standing Army. Reduction of the Number of the Hours of Labour. Equal Electoral Rights, with Payment of Members. The success of our efforts will depend upon the pressure that can be brought to bear upon the powers that be, and this requires numbers, union organisation and combination. We therefore call upon you to unite, organise and combine and raise the cry throughout Ireland, Scotland, Wales and England, “The Land for the People” — the rightful inheritors of nature’s gifts. No rational state of society can leave the land, which is the source of life, under the control of, and subject to the whims and caprices of, a few private individuals. A government elected by, and as trustee for, the whole people is the only power that can manage it for the benefit of the entire community. Insist upon the State reclaiming the unoccupied lands as a beginning of its nationalisation, and placing the unemployed upon it. Let not another acre of common land be enclosed for the private purposes of non-producers. Compel the Government to employ the army until its final dissolution, as a pioneer force to weed, drain and level the wastes for cultivation, instead of forming encampments to prepare for the destruction of life. If green fields and kitchen gardens are incompatible with the noble sport of hunting let the hunters emigrate. Make the Nine points of the League the Labour programme the touchstone by which you test the quality of candidates for parliamentary honours, and if you find them spurious reject them like a counterfeit coin, for he who is not for them is against you. You are swindled out of the fruits of your toil by land laws, money laws, and all sorts of laws. Out of the paltry pittance that is left you, you have to pay the interest of a debt that was incurred to keep you in subjection. You have to maintain a standing army that serves no other purpose in your generation, and you are systematically overworked when employed, and underfed at all times. Nothing but a series of such reforms as indicated on our programme will ever lift soil out of the slough of despond in which you are at present sunk. The difficulty can be overcome by unity of purpose and action. We are our opponents are few. Then, working men and women of all creeds and occupations, claim your rights as with one voice, and rally round, and unite your forces under, the banner of the “Land and Labour League” to conquer your own emancipation! Thanks to Keith Scholey for some of this post… Readers interest in the secularist, republican scene in London between the 1850s and 1880s, especially the followers of Bronterre O’Brien, could do worse than read Club Life and Socialism in Mid-Victorian London, by Stan Shipley. EP Thompson’s biog of William Morris, Romantic to Revolutionary, and The Slow Burning Fuse, by John Quail, pick up the threads of this, describing how many of these elements went on to form the early English socialist and anarchist movements. Today in London’s media history: exiled German socialist/anarchist paper Freiheit begins publishing, 1879. The German-language socialist (later anarchist) paper Freiheit (meaning Freedom) was first published from London, though mainly aimed at distribution in Germany, on 4th January 1879. Here’s a good account of the paper’s early years and the context that gave birth to it, from ‘The Slow Burning Fuse, The Lost History of the British Anarchists’, by John Quail. “There had been German political refugees in London since the events of 1848, one of the better known of them being Karl Marx. For the most part these refugees were men mostly ‘past middle age and already long-standing members of some English trade union or another, and their meetings were mainly social affairs where politics were discussed as part of a pleasant chat over a drink. There was, however, a steady influx of younger men with more activist tendencies. This influx was to turn into a flood as a result of the German Anti-Socialist Laws; yet the quickening of the German political atmosphere to which these Laws were something of a response had already affected the German exiles by 1877. One consequence was that at an informal gathering after the Cleveland Hall meeting Kitz describes how he was ‘urged by my comrade Johann Neve’ (of whom more later) ‘to form an English section of the Socialist party. I succeeded in getting together a number of comrades including those of the British Federation whom I have already referred to and thus was started an English Revolutionary Society, which, working with the foreign element was to take its part in the International Socialist movement ( … )’ This English Revolutionary Society was a part of the Social Democratic Club which met in pubs in Soho from its foundation in August 1877 until it found permanent premises in Rose Street ( now Manette Street ) in 1878. There were some five sections according to nationality with Frank Kitz as secretary of the English section. The move to club premises was important because now discussion and organisation could go ahead without the interference of landlords; and without the expense of hired rooms, says Kitz,’we were enabled to hold public meetings with greater frequency’. When a wave of refugees arrived in London from Germany after the passage of the Anti-Socialist Laws in 1878, the Rose Street club became a central point for defence and aid. The general publicity given to the Laws also attracted attention to the thing they were designed to repress. ‘Shortly after this influx of refugees,’ writes Kitz, ‘the sections jointly issued a pamphlet by J. Sketchley, entitled The Principles of Social Democracy thus taking advantage of the interest awakened ( … ) Many thousands of this pamphlet were sold, the German section bearing the major portion of the cost, in order to aid propaganda among our own working class. The English section undertook the reissue of two pamphlets on Communism by H. Glasse; they also published an address to the amnestied Communists of Paris and 50,000 copies of this leaflet were distributed’. (Sketchley, incidentally, was an old Chartist. ) In order to understand the reasons for and the consequences of the Anti-Socialist Laws it is necessary to explain in more detail what was happening in Germany in this period. A German Anarchist movement had existed since the mid-1870s. Their propaganda was spread by wandering agitators and smuggled newspapers. It was a small movement, in isolation, yet it began to have some influence on the left wing of the Social Democratic Party. This influence grew because of the anomalous position of the party. It was rapidly increasing the number of seats it held in the Reichstag ( and displaying all the tendencies towards respectability which such positions seem to entail ). On the other hand, however, even a majority of seats held by the SDP in the Reichstag would have given it no real power. The Reichstag was able, under the constitution, only to advise the Kaiser and his Chancellor; and the latter were able to ignore this advice, constrained only by a wish to preserve the forms of government by consent. The extent to which the Anarchists began to have influence among the party’s left wing was the extent to which it began to see that even quite modest reforms might only be achievable by revolutionary means. And he goes on to say that this action will be ‘sometimes collective, sometimes purely individual’ but that it would neglect no ‘means at hand …to awaken audacity and the spirit of revolt by preaching by example’. This preaching by example was later to be better known as ‘propaganda by deed’. The theory of propaganda by deed seemed to invite the most spectacular actions and in Germany it led to two attempts on the life of the Kaiser. In May 1878 Emil Hödel, and in June of the same year Carl Nobiling, shot at the Kaiser as he was driven through the streets in an open carriage. Both attempts failed. The failed assassins both had links with known German Anarchists and Hödel declared himself an Anarchist at his trial. He was beheaded. Nobiling died of self-inflicted wounds. No revolutionary upsurge accompanied these attempts, any such thing being pre-empted in any case by the frantic reaction of the German authorities. Bismarck, the German Chancellor, irritated by the growing electoral strength of the SDP, constitutionally circumscribed and severely legalistic though it was, seized upon the assassination attempts as an opportunity to smear the party. The result of his efforts was the Anti-Socialist Laws of October 1878. After the second assassination attempt Berlin became an armed camp. All known socialists had their homes raided. Even before the passage of the Laws over 500 people had been arrested and sent to jail for ‘insulting the Kaiser’ or ‘approving’ of the attempts on his life. Some of the cases would have been laughable had it not been for the suffering involved : “A drunken man received two and a half years in prison for murmuring ‘William is dead, he lives no more.” A woman talking about the Emperor’s wounds was sentenced to a year and a half for saying “The Kaiser at least is not poor, he can afford to care for himself.” A worker, while sitting on a bench along Unter den Linden was heard to say that “Hödel is a dumb-bell but Nobiling planned his attempt well.” This slip of his tongue cost him four years of his freedom. The results of the repression were twofold. Firstly, as far as the left-wing socialists were concerned the mask of the democratic process was ripped away to reveal black reaction. Secondly, socialist agitation of any sort was made both doubly difficult and very much more dangerous. A wave of socialist refugees left Germany and many came to London. Frank Kitz described the situation : ‘Thousands were expatriated, hundreds of families broken up, hundreds imprisoned; seizures and confiscations were the order of the day. Of those torn from their families a number went insane and others were irretrievably ruined; a great number sought refuge in London and our club in Rose Street presented at times the appearance of an arrival or departure platform at a station with luggage and cases of prohibited literature and the bewildered emigrants going to and fro.’ The bitterness caused by the repression and the AntiSocialist Laws probably made more Anarchists than the German authorities had been able to silence by their measures. For some years London was to be the major centre for the production of German revolutionary and Anarchist propaganda and the organisation of its secret distribution. Into the embittered society of the German exiles in London came Johann Most, later to be the central figure in a case which was to prove a rallying point for the new socialist movement. When he arrived in London, Most was a dissident left-wing Social Democrat who had been forced out of Germany. No theoretician, as a bitterly sarcastic and humorous speaker and journalist who was popular with working-class audiences, he had earned himself some notoriety and a string of jail sentences. He had been elected to the Reichstag, which he found frustrating, until another jail sentence for a speech on the Paris Commune put an end to his political career. On his release he edited a Berlin Social Democrat newspaper whose circulation he boosted from 2,000 to 18,000 in a year. Further activities in this direction were abruptly halted after Hödel’s attempt. Most spoke about it at a meeting and though his comments were not approving he was arrested and sentenced to six weeks’ imprisonment. When this term was up he was sentenced to a further five months, which he spent in solitary confinement. In December 1878 he was released and given twenty-four hours to leave Berlin. He went to Hamburg, where the local party leaders, their nerve completely shot, advised him to emigrate to America. Most did leave Germany but went instead to London, arriving just before Christmas 1878. Most’s energy was unaffected by his prison sentences and expulsion. With the financial and practical help of members of the Rose Street club, the first issue of Freiheit, a paper designed for illegal distribution in Germany, was published on 4 January 1879. At first it described itself as a Social Democrat paper but from February 1879 onwards it steadily downgraded the importance of electoral activity; and in 1880 it began printing specifically Anarchist articles. At this time, too, fairly formal links were alleged to exist between Most and ‘the younger generation of Bakuninists in Paris, the group that publishes the Révolution Sociale’. Once the paper was established a number of successful networks were set up for smuggling the paper into Germany. Large numbers were sewn into mattresses in a factory in Hull and exported. Sailors carried quantities of it from England to Germany via Hamburg. Each issue of the paper was given a different title so that the authorities had to first find out its name before banning it. Naturally German police spies were sent to try and infiltrate the smuggling networks and the group round the paper. Kitz relates that on several occasions ‘we were puzzled by the fact that the German Government was aware of the new titles before the paper reached Germany, and thus forestalled us. Johann Neve and I set out to find the cause. Suspecting a member who had recently joined we supplied him with a specially printed copy of the paper bearing a title different from the one we actually intended to use. The bogus title was prohibited but the other escaped. I regret to say that this member met with a serious accident when attending a fête held in support of the Freiheit.’ The spy was shot and seriously wounded on Hampstead Heath. The mixture of political ideas in Freiheit at this time represented fairly accurately Most’s own ideas, which took parts of left Social Democracy, Blanquism (i.e. putschist republicanism ) and Anarchism but which were marked by strident calls for revolutionary violence that grew out of a wild and bitter response to the repression in Germany. His itch for vengeance found an exemplary object in the assassination of Tsar Alexander II by Russian nihilists in 1881. Freiheit published an article by Most entitled ‘Endlich’ ( ‘At Last’ ) which enthusiastically supported their action. The Russian government applied pressure – pressure from the German government can be assumed to be constant – and Most was prosecuted by the British authorities. He was found guilty of incitement to murder heads of state and sentenced to eighteen months’ imprisonment. His arrest and sentence caused something of a stir in London Radical and socialist circles. A short-lived English-language paper also entitled Freiheit was issued by the English section of the Rose Street club as the organ of a Defence Committee. Frank Kitz was the editor. The paper printed an English translation of Most’s article but avoided being enmeshed in the prosecution by presenting it as part of the speech of the prosecuting counsel at the trial ! Jack Williams stood on the steps of the Old Bailey during the trial and sold many copies of this edition. Protest meetings were held, some successful as at Mile End Waste in April, some less so as at Peckham where ‘the Radicals combined with Tories; opposed the speakers and were only prevented by force from seizing the platform…’ The prosecution of Most was opposed publicly on the grounds of the right of asylum and the right of free speech ( although the first issue of the Freiheit did reprint some approving remarks of Disraeli’s on tyrannicide ). Such an approach did find quite wide sympathy – the jury at Most’s trial asked that he be treated with some mercy since he might be suffering from violent wrong done to him in Germany. Freiheit, however, carried on production in the US. With Most, at the helm, the paper was not shy about criticising fellow anarchists, and work published in Freiheit often fomented controversies in anarchist circles. Splits and rows with other groups were common. For instance, Most’s arguemnts with Joseph Peukert led to the founding of a rival journal, Der Rebell; and Most and Benjamin Tucker carried out a long-running spat through the pages of their respective journals. A few years later, Emma Goldman and Alexander Berkman became involved with the Freiheit group, but left, after arguing with Most. When Berkman, inspired by Most’s theory of the attentat, was imprisoned for the attempted assassination of Henry Clay Frick, Most criticised Berkman’s action. Incensed, Goldman publicly attacked Most with a horsewhip at one of his lectures. The journal’s publication occasionally faltered when Most was imprisoned—at least once, for writings he published in Freiheit —but fellow anarchists kept the journal afloat during those times. When its charismatic founder and editor died in 1905, Freiheit went into a decline, and ceased publication in 1910 after 28 years. Today in London rebel history: John de Morgan goes to court over Plumstead Common enclosure riots, 1876. For centuries Plumstead Common belonged to the Provost and Scholars of Queens College, Oxford. Freehold tenants had enjoyed rights of cattle-grazing, and collection of gravel, turf, loam etc for centuries. It was a wild and picturesque place, loved by locals, especially kids. Troops had been allowed to exercise here in the 19th Century, leading to “the present ruinous condition of the remoter half” (WT Vincent). In 1816 two plots of land were enclosed where Blendon Road and Bramblebury Road are now, and in the 1850s an area between The Slade and Chestnut Rise was sold. There were “distant rumblings” of protest in parish meetings, but no more. Some small plots enclosed on the fringes of the Common were given to poor widows to keep them out of the workhouse (more to cut expenses to the ratepayers than from generosity possibly). From 1859 however, the College aggressively pursued a policy of excluding freeholders, asserting they were practically the owners of the waste land. Various encroachments were made, reducing the Common by a third: in 1866 the whole of Bostall Heath and Shoulder of Mutton Green were enclosed. This led to local outrage, meetings of residents of East Wickham, and the forming of a protest committee, led in March 1866 to the forcible removal of the fences around the Green, and also destruction of fences near the Central Schools around Heathfield and Bleakhill. In a legal challenge by Manor tenants to the College, the Master of the Rolls ruled the enclosures on the Common and Bostall Heath out of order. Fences belonging to William Tongue were pulled down. There was talk of pulling down Hughes’ house as well. Hughes called the coppers, and some nickings followed. The next day 100s of people gathered and attacked fences put up by a Mr Jeans. When the bobbies arrived many vandals took refuge in the local pubs. From 1871, the military from nearby barracks took over large sections for exercises and drilling, as Woolwich Common was too small and swampy: the squaddies soon trashed the place, stripping all the grass and bushes and brambles. Protests followed, but nothing changed. In 1876, Queens College decided to lease the greater part of the common permanently to the army for extensions to the Woolwich Barracks/parade grounds. Local people, including many workers from Woolwich Dockyard, objected to the plans; notices appeared around the town in late June calling for a demonstration. The main organiser of the demo was John de Morgan, an Irish republican & agitator, who had been involved in struggles against enclosures in Wimbledon and over the resistance to enclosure of Hackney Downs in 1875. De Morgan was a charismatic, self-publicising and provocative figure, a freelance editor, orator & teacher, who had been driven out of Ireland for trying to start a Cork branch of the International Workingmens Association (the First International). He had long been a Secularist and Republican, but had fallen out with some radicals and other Secularists. On July 1st over 1000 people held meetings in the Arsenal Square and the Old Mill pub, marched up to the north side of the Common (around St Margaret’s Grove) and peacefully tore down fences. Again fences belonging to Edwin Hughes and William Tongue were destroyed – the crowds now had added grudges against them. Both had recently been involved in crushing an 1876 strike by local carpenters and bricklayers over pay and piecework, making then doubly hated. Tongue had brought in scabs to break the strike and Hughes prosecuted strikers for leaving work (under the notorious Employers and Workman’s Act.) A widely disliked Mr Jacobs, who leased a sandpit off the College, also had fences broken. The following day (Sunday) a crowd returned to demolish the already rebuilt fences: a police attack led to a battle with stones thrown and fires started. Monday saw more rioting: according to a hostile witness there were 10,000 there on Monday and Tuesday, and “I never saw a scene so disorderly and lawless.” The furze on Tongue’s land was set on fire. While the cops brought it under control, enthusiastic meetings continued. Although many rioters were costermongers, local coalheavers, labourers from the Woolwich Arsenal (700 men took the day off from one department here to hear a de Morgan speech), many more ‘respectable’ workmen were up there trashing the fences. Hughes used his influence to press for charges against the organisers of the demonstrations: John de Morgan and several other organisers were charged with incitement to riot (although de Morgan had not even been present after the July 1st events). There was clear disagreement locally over methods of saving the Common: obviously the more respectable campaigners plumping for legal means and disapproving of the rioting. Local secularist Robert Forder (another defendant in the Riot trial) also bitterly criticised De Morgan, accusing him of pocketing defence funds. He did however have previous issues with De Morgan; in the bitter splits in the Secularist movement, the Irishman had opposed Charles Bradlaugh, while Forder had supported him. At the trial, in October 1876 at Maidstone, 3 men including Forder were acquitted, but de Morgan was found guilty. Sentenced to a month in jail, he was unexpectedly released early: a planned 20,000-strong march to demand his release turned into a mass celebration with bands. Effigies of Hughes and Kentish Independent journalist (and later historian of the area) WT Vincent, who had given evidence against de Morgan, were burned on the Common at the Slade. Hughes also sued the liberal Woolwich Gazette and the Man of Kent newspapers for printing de Morgan’s ‘libellous’ speeches. In the aftermath of the riots, the constitutional campaigners stepped up their negotiations with the Queens College, in an attempt to prevent further rioting. The upshot was that the Metropolitan Board of Works bought Plumstead Common for £16,000, and remains a public open space. John de Morgan’s fantastic rollercoaster career continued after his release from prison; attempting unsuccessfully to stand for Parliament, to set up a national ‘people’s party’ under the banner of the People’s Political Union. He then emigrated to the United States in 1880, abandoning his wife and children; where, apart from continuing a vaguely radical political trajectory, he became a writer of dime novels, mostly for the adolescent market, varying from pseudo science fiction, to colonial and American revolutionary war stories, and may have influenced Edgar Rice Burroughs… and later was appointed as a Deputy Tax Receiver on Staten Island. Today in London radical history: second day of riots against the enclosure of Plumstead Common, 1876. Plumstead Common, a stretch of open space in what is now South-east London, was threatened by development in the late nineteenth century. Like hundreds of other commons, greens and woods across the country, it was saved for all by collective action by local people, and today remains a public space as a result. By the nineteenth century, Plumstead Common was owned by the Provost and Scholars of Queens College, Oxford. Freehold tenants had enjoyed rights of cattle-grazing, and collection of gravel, turf, loam etc for centuries. It was a wild and picturesque place, loved by locals, especially kids. But troops from nearby Woolwich Barracks had been allowed to exercise here in the 19th Century, leading to “the present ruinous condition of the remoter half” (W.T. Vincent). It had become partly waste, which left it vulnerable to pressures for parts to be sold off and built on. The was massive demand for land in the area, as there was all over London; many other open spaces were lost at this time. In 1816 two plots of land were enclosed, where Blendon Road and Bramblebury Road now stand. In the 1850s another area, between The Slade and Chestnut Rise, was sold. These encroachments on the Common caused “distant rumblings” in meetings of the Parish Vestry (effectively the local council). No action was taken, apart from to grant some small plots enclosed on the fringes of the Common to poor widows to keep them out of the workhouse (more to cut expenses to the ratepayers than from generosity possibly). From 1859 however, the College, the Lords of the Manor, aggressively pursued a policy of excluding freeholders, asserting they were practically the owners of the waste land. The people of Plumstead strongly opposed the ambitions of Queens College stating that they had the right to graze cattle, geese and other livestock, the right to cut turf and to dig for sand and gravel on the Common. Also they claimed the right to use the open space for sports and other pastimes. Various encroachments were made, reducing the Common by a third: in 1866 the whole of Bostall Heath and Shoulder of Mutton Green were enclosed. ‘Illegal’ encroachments continued though – often facing unofficial demolition by locals. The Plumstead Vestry even passed motions in favour of the demolitions! The main targets were the property of William Tongue, a rich local builder who had bought some land on the Common and put fences up, and his crony, magistrate Edwin Hughes, Chairman of the Vestry and later Tory MP for Woolwich. Hughes was a very powerful man locally, said to have “had the key to the Borough in his pocket”. He had bought land off Tongue to add to his garden. Tongue had already been the focus for trouble in 1866 over his enclosing ways. On a Saturday in May 1870, “a number of the lower class, who were resolved to test their rights” demolished some enclosure fences and carried off the wood. “A party of women, armed with saws and hatchets, first commenced operations by sawing down a fence enclosing a meadow adjoining the residence of Mr Hughes…” Fences belonging to William Tongue were pulled down. There was talk of pulling down Hughes’ house as well. Hughes called the cops, and some nickings followed. The next day 100s of people gathered and attacked fences put up by a Mr Jeans. When the bobbies arrived many vandals took refuge in the local pubs. In 1876, Queens College decided to lease the greater part of the Common permanently to the army for extensions to the Woolwich Barracks/parade grounds. Local people, including many workers from Woolwich Dockyard, objected to the plans; notices appeared around the town in late June calling for a demonstration. The main organiser of the demo was John de Morgan, an Irish republican & agitator, who had been involved in struggles against enclosures in Wimbledon (in 1875) & in Leyton and Hackney. He had founded a Commons Protection League in Plumstead. De Morgan seems to have been a charismatic (or self-publicising) and provocative figure, a freelance editor, orator & teacher, who had been driven out of Ireland for trying to start a Cork branch of the International Workingmens Association (popularly known as the First International). He had long been a Secularist and Republican, but he fell out with some radicals and other Secularists. On July 1st 1876 over 1000 people held meetings in the Arsenal Square and the Old Mill pub, marched up to the north side of the Common (around St Margaret’s Grove) and peacefully tore down fences. Again fences belonging to Edwin Hughes and William Tongue were destroyed. A widely disliked Mr Jacobs, who leased a sandpit off the College, also had fences broken. The following day (Sunday 2nd) a crowd returned to demolish the already rebuilt fences: a police attack led to a battle with stones thrown and fires started. Monday saw more rioting: according to a hostile witness there were 10,000 there on Monday and Tuesday: “I never saw a scene so disorderly and lawless”, said local journalist WT Vincent. The furze on Tongue’s land was set on fire. While the cops brought it under control, enthusiastic meetings continued. Although many rioters were identified as costermongers (street-traders), local coalheavers, labourers from the Woolwich Arsenal (700 men took the day off from one department here to hear a de Morgan speech), many more ‘respectable’ workmen were also seen trashing the fences. Hughes had a lot of local clout, and John de Morgan and several other organisers of the demonstrations were charged with incitement to riot (although de Morgan had not even been present after the July 1st events). At the trial, in October 1876 at Maidstone, three men including Forder were acquitted, but de Morgan was found guilty. Sentenced to a month in jail, he was unexpectedly released early: a planned 20,000-strong march to demand his release turned into a mass celebration with bands. Effigies of Hughes, and of Kentish Independent journalist W.T. Vincent, who had given evidence against de Morgan, (and later wrote a history of the area) were burned on the Common at the Slade. Hughes also sued the liberal Woolwich Gazette and the Man of Kent newspapers for printing de Morgan’s ‘libellous’ speeches. In the aftermath of the riots, the constitutional campaigners stepped up their negotiations with the Queens College, in an attempt to prevent further rioting. The upshot was that the Metropolitan Board of Works bought Plumstead Common for £16,000. In 1878, the Plumstead Common Act ensured that about one hundred acres of land remained as public open space forever. The Act was passed just in time as some roads had been built across the Common effectively dividing it into the two portions that can be seen today. However, some local gentry also opposed the enclosures (while not supporting the rioting) for their own reasons, it was not simply a division along class lines. This can usually be found in many of the anti-enclosure movements mentioned here: they were rarely unified in tactics, or even in their motives for opposition. This is an edited version an extract from past tense’s pamphlet ‘Down With the Fences’, which is available from our publications page. 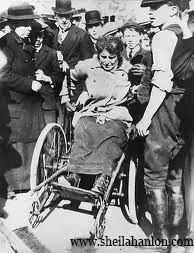 Today in London’s rebel history: disabled suffragette Rosa May Billinghurst born, Lewisham, 1875. Rosa May Billinghurst (1875-1953) was born and raised in Lewisham, London. As a child, she contracted an illness which left her paralyzed from the waist down. Her condition did not, however, deter her from joining the suffragist Women’s Social & Political Union in 1907 or becoming one of its best known militants. 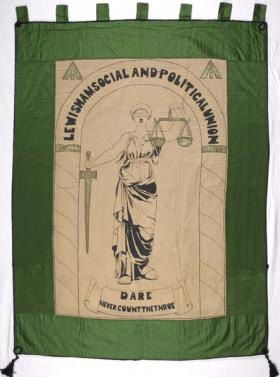 In the years after the suffrage era, Billinghurst remained committed to the cause, joining the Suffragette Fellowship and supporting Christabel Pankhurst’s election campaign for The Women’s Party in 1918. G H Baskomb was the owner of a windmill built in 1796 on common land on Chiselhurst Common, now Southeast London (though on the northern edge of Kent then). There are three main areas of Chiselhurst common: by the parish church, the area around the cricket ground and Mill Place; and the largest section which begins in the east by Camden Place and continues between Prince Imperial Road and Bromley Road, across Centre Common Road as far as, and just beyond, Kemnal Road. This last part of the Commons extends down to the High Street: St Pauls Cray Commons lies to the south east of Chislehurst straddling the road to Orpington. This land was owned originally by the Crown, and later by the Scadbury, Walsingham and Townsend families, who lived at Scadbury and Frognal and held the position of Lord of the Manor. Before the years of development following the arrival of the railways the Commons were regarded as open to the villagers and available for them to use for grazing of their livestock. Once building started here in earnest, the land became valuable. Huge swathes of common land in other parts of England were sold off as part of the enclosures, and here in Chislehurst, the Commons were in danger of being ruined by excavations of valuable road building material, and the cutting of turf. But due to the valiant efforts of local residents, the Chislehurst and St Paul’s Cray Commons were saved for public use with the passing of the Metropolitan Commons Supplemental Act in 1888. On 20 May 1876, Baskomb, proprietor of a brick and tile works and par-owners of the famous Chiselhurst caves. ordered the pulling down of the windmill, and fenced off the land to sell off for building on. But locals, accustomed to wandering on the common at will, kept pulling the fence down at night, repeating the sabotage every time he put it up. A public meeting threatened legal action against him… Baskomb eventually backed down, and a process began to protect the common for future generations. Many commons were saved from enclosure, encroachment and development by a variety of efforts – some legal, some illegal. The Metropolitan Commons Act of 1866 was passed in order to assign management responsibilities to boards of conservators and facilitate the control of digging for gravel, and other forms of damage. This Act did not apply directly to Chiselhurst and St Pauls Cray Commons, and so a group of prominent residents formed the Chislehurst and St Paul’s Cray Commons Preservation Society and finally achieved the passage of the Metropolitan Commons (Chislehurst and St Paul’s Cray) Supplemental Act in 1888. It is this Act, together with its attached scheme of management, which continues to regulate the management of the Commons. Although the Commons are in private ownership, under the terms of the 1888 Act, responsibility for their management, in perpetuity, resides with a Board of Conservators, now known as the Trustees of the Commons. Under the 1888 Act the Trustees are empowered to make Bye-Laws to protect the Commons. The authority of the Trustees has been further strengthened by the Commons Act, 2006.